There may not be many, but if the uranium line can be seen and measured in more spectra, it will also become possible to judge whether those very old stars, as surmised（猜测）, are all of about the same age, i.e. that of our Milky Way galaxy. They measured for the first time the amount of the radioactive isotope Uranium-238 in a star that was born when the Milky Way, the galaxy in which we live, was still forming. It is the first measurement ever of uranium outside the Solar System.This method works in a way similar to the well-known Carbon-14 dating in archaeology, but over much longer times. Ever since the star was born, the Uranium "clock" has ticked away over the eons, unaffected by the turbulent history of the Milky Way. It now reads 12.5 billion years. Since the star obviously cannot be older than the Universe, it means that the Universe must be older than that.Although the stated uncertainty is still about 25% or about ±3 billion years, this is only to a minor extent due to the astronomical observation. The main problem is the current absence of accurate knowledge of some of the basic atomic and nuclear properties of the elements involved. However, further laboratory work will greatly improve this situation and a more accurate value for the age of the star and implicitly, for the Universe, should therefore be forthcoming before long.This important result is reported in the international research journal Nature in the issue of February 8, 2001.PR Photo 05a/01: The 12.5-billion-year old star CS 31082-001.PR Photo 05b/01: The telltale spectral line in CS 31082-001 - the first detection of uranium outside the Solar System. While hydrogen, helium and lithium were produced during the Big Bang, all heavier elements result from nuclear reactions in the interiors of stars. When stars die, heavy-element enriched matter is dispersed into surrounding space and will later be incorporated in the next generations of stars. In fact, the gold in the ring on your finger was produced in an exploding star and deposited in the interstellar cloud from which the Sun and its planets were later formed. Thus, the older a star is, the lower is generally its content of heavy elements like iron and other metals. Measurements have shown that old stars that are members of large agglomerations known as globular clusters are normally quite "metal-poor"- their metal-content ranges down to about 1/200 of that of the Sun, in which these metals constitute only 2% of the total mass, the rest being still in the form of hydrogen and helium. After decades of mostly fruitless efforts, a large spectral survey by American astronomer Timothy C. Beers and his collaborators has recently uncovered hundreds of stars with much lower metal content than even the globular clusters, in some cases only 1/10,000 of the solar value. It is evident that these extremely metal-poor stars must have formed during the very infancy of the Milky Way, an important, but still poorly understood phase in the life of our galaxy. These particular stars exhibit a great variety of element abundances that may ultimately throw more light on the processes at work during this early period. As a step in this direction, an international team of astronomers  decided to study these stars in much more detail. They were awarded observing time for a Large Programme in 2000-2001 with the powerful combination of the ESO VLT and its very efficient high-dispersion spectrograph UVES. The first observations have been carried out and, not unexpectedly, have already proven to be a true gold mine of new information. It is possible to make a fundamental determination of the age of a star that is quite independent of stellar evolution models, provided it contains a suitable long-lived radioactive isotope . The use of a "radioactive chronometer" depends on the measurement of the abundance of the radioactive isotope, as compared to a stable one. This technique is analogous to the Carbon-14 dating method that has been so successful in archaeology over time spans of up to a few tens of thousands of years. In astronomy, however, this technique must obviously be applied to vastly longer time scales. For the method to work well, the right choice of radioactive isotope is very critical. Contrary to stable elements that formed at the same time, the abundance of a radioactive (unstable) isotope decreases all the time. The faster the decay, the less there will be left of the radioactive isotope after a certain time, the greater will be the abundance difference when compared to a stable isotope, and the more accurate is the resulting age. This leaves only two possible isotopes for astronomical measurements, thorium (232Th or Thorium-232, with a half-life of 14.05 billion years ) and uranium (238U or Uranium-238, half-life 4.47 billion years). Several age determinations have been made by means of the Thorium-232 isotope. Its strongest spectral line is measurable with current telescopes in a handful of comparatively bright stars, including the Sun. However, the decay is really too slow to provide sufficiently accurate time measurements. It takes around 47 billion years for this isotope to decay by a factor of 10, and with a typical measuring uncertainty of 25%, the resulting age uncertainty is about 4-5 billion years, or approx. one third of the age of the Universe. This slow-moving clock runs forever, but is hard to read accurately! The faster decay of Uranium-238 would make it a much more precise cosmic clock. However, because uranium is the rarest of all normal elements, its spectral lines in stars are always very weak; if visible at all, they normally drown entirely in a vast ocean of stronger spectral lines from more abundant elements. Nevertheless, this is exactly where the low abundance of heavier elements in very old stars comes to the rescue. In the stars that were studied by the present team at the VLT, with typically 1000 times less of the common elements than in the Sun, the predominance of the maze of atomic and molecular lines in the spectrum is greatly reduced. The lines of rare elements like uranium therefore stand a real chance of being measurable. This is particularly so, if for some reason uranium atoms were preferentially retained in the debris of those early supernova explosions that also created the iron-group elements we see in the stars today. ESO PR Photo 05a/01[Preview - JPEG: 337 x 400 pix - 32k][Normal - JPEG: 674 x 800 pix - 120k]	Caption: PR Photo 05a/01 displays the Milky Way star field around CS 31082-001, the 12th-magnitude star at the centre. The "cross" is caused by reflections in the telescope optics, a typical effect for relatively bright stars. Technical information about this photo is available below. ESO PR Photo 05b/01[Preview - JPEG: 501 x 400 pix - 42k][Normal - JPEG: 1001 x 800 pix - 128k][Full-Res - JPEG: 1502 x 1200 pix - 200k]	Caption: PR Photo 05b/01 The observed spectrum (dots) of the old star CS 31082-001 in the region of the uranium (U II) line at 385.96 nm. The origin of some of the other spectral lines in the region is also indicated (e.g. iron, neodymium). The synthetic spectrum (thin line) was computed for the adopted abundances of the stable elements and for four different values of the abundance (by number) of uranium atoms in the atmosphere of the star. The uppermost line (corresponding to no uranium at all) clearly does not fit the observed spectrum at all. The best fit is provided by the middle (red) line, representing a uranium abundance of approximately 6% of the solar value - see also the text. Technical information about this diagramme is available below. The excitement of the astronomers was great when they inspected the first spectrum of the 12th-magnitude programme star CS 31082-001! It showed what is probably the richest spectrum of rare, heavy elements ever seen. In particular, the faint lines of these elements were unusually free of interference from the lines of the iron-group elements which are indeed only 1/800 as abundant in this star as in the Sun, and by molecular lines (of CH and CN), often quite numerous even in such low-metallicity stars. While only one or at most two thorium lines have ever been measured in any other stars, no less than 14 thorium lines are seen in the spectrum of CS 31082-001. Indeed, there is such a wealth of lines of other rare and precious metals that this spectrum is a real astronomers' treasure box. And best of all, the long sought-after line of singly ionized uranium is clearly detected at its rest wavelength of 389.59 nm in the near-ultraviolet region of the spectrum, cf. PR Photo 05b/01! Not surprisingly, the uranium line is still quite weak. After all, uranium is the rarest of elements to begin with and it has further decayed by a factor of eight since this star was born. Moreover, even in this low metal-abundance star, the near-UV spectrum remains rather rich in other lines. The accurate measurement of this faint spectral line therefore places extreme demands on the acuity (resolving power) and efficiency of the spectrograph and the light-gathering power of the telescope. The VLT and UVES have been built as the world-leading combination of these observational assets, and the spectra obtained of this comparatively faint star (magnitude 12, i.e. 500 times fainter than what can be seen with the unaided eye) are absolutely superb - indeed of a quality which until recently was reserved for naked-eye stars only. Despite its faintness, the uranium line can therefore be measured with very good accuracy. A detailed analysis, using model atmospheres and synthetic spectrum calculations, shows that all the heaviest stable elements follow closely the abundance pattern seen in the Sun, but at a level of about 12% of the corresponding solar abundances . The measurements also show that the thorium and uranium abundances are somewhat lower than this - of the order of 9% and 6% of the solar values, respectively. Since these two elements were formed by the same atomic processes as their stable neighbours in the periodic table, this means that radioactive decay has progressed further in CS 31082-001 than in the Sun. Different models of the element production in supernova explosions predict somewhat different production ratios between the stable and radioactive isotopes, leading to age estimates for this star in the range 11-16 billion years. The most likely age of CS 31082-001 is 12.5 billion years. The Universe is older than the star, hence it must be older than 12.5 billion years. Given the faster decay rate of Uranium-238, the measuring uncertainty for the stellar uranium line corresponds to an age uncertainty of only ±1.5 Gyr. This can be further reduced with even better spectra of CS 31082-001 and/or with the discovery and observation of other similar stars. However, for the immediate future, the accuracy of this age determination does not really depend on the VLT spectrum. For the time being, the real problems are the present uncertainties in the available laboratory data for uranium by means of which the measured line strengths are converted into element abundances. In addition, the nuclear-physics calculations of the initial isotope production ratios introduce errors that are larger than those of the spectral observation. Thus, improved measurements of those physical data are necessary in order to read more accurately the cosmic clock in CS 31082-001 from the existing observational data. The relevant laboratory measurements are now underway at the CEA, Saclay, France, and the University of Lund, Sweden. In the meantime, the team is trying to find other stars like CS 31082-001. 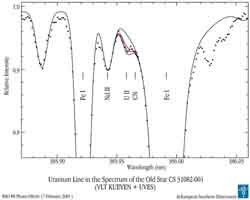 There may not be many, but if the uranium line can be seen and measured in more spectra, it will also become possible to judge whether those very old stars, as surmised, are all of about the same age, i.e. that of our Milky Way galaxy. The research described in this Press Release is reported in a research article ("Measurement of stellar age from uranium decay"), that appears in the international research journal Nature on Thursday, February 8, 2001.
: 1 billion = 1,000 million. : The team members are: Roger Cayrel (P.I. ), Francois Spite and Monique Spite (all Observatoire de Paris, France), Vanessa Hill and Francesca Primas (ESO), Johannes Andersen and Birgitta Nordstr?m (Copenhagen and Lund Observatories, Denmark and Sweden), Timothy C. Beers (Michigan State Univ., USA), Piercarlo Bonifacio and Paolo Molaro (Trieste, Italy), Bertrand Plez (Montpellier, France), and Beatriz Barbuy (Univ. of Sao Paulo, Brazil). : Isotopes of a natural element contain different numbers of neutrons in the nuclei, in addition to a certain number of protons that characterize that particular element. Some isotopes are "radioactive", i.e. with time they are transformed into other elements or isotopes. Other isotopes are stable over exceedingly long periods of time. Uranium-238 contains 92 protons and 146 neutrons. : The "half-life" of an isotope indicates the time after which half the atoms have decayed. After another time interval of this length has passed, only 25% of the original isotope is left, etc. 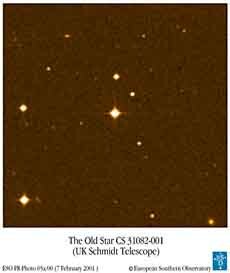 : As the iron abundance in CS 31082-001 is only 0.12% (1/800) of that in the Sun, this means that, relative to iron and similar, lighter elements, the heaviest elements in that star are approximately 100 times "overabundant". Their spectral lines, again in relative terms, are correspondingly stronger - this is of crucial importance for the present, difficult measurements. PR Photo 05a/01is reproduced from the STScI Digitized Sky Survey (? 1993, 1994, AURA, Inc. - All Rights Reserved) and based on blue-sensitive photographic data obtained using the UK Schmidt Telescope at Siding Spring (Australia). The comparatively empty sky field is located at high southern (-76°) galactic latitude and measures 7 x 7 arcmin2. PR Photo 05b/01 is reproduced from a spectrum of CS 31082-001, obtained in October 2000 with the UVES high-dispersion spectrograph at the VLT 8.2-m KUEYEN telescope at Paranal. The exposure lasted 4 hours, at a spectral resolution of approx. 75,000 and with a S/N-ratio of about 300. The lines are identified and three synthetic spectra, with different U-abundances, are drawn to illustrate the fit.